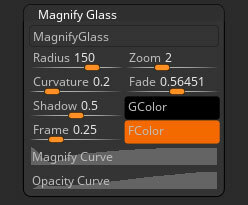 When the Magnify Glass is enabled ZBrushCore will display a small magnifier to magnify UI and Document. You can adjust the magnifier to you requirements by adjusting the radius, zoom strength, curvature and other settings. The Radius slider sets the radius of the Magnify Glass. A high value will give a larger Magnify Glass. The Zoom slider sets the zoom factor for the Magnify Glass. A higher value will give greater magnification. The Curvature slider sets the amount of distortion for the Magnify Glass. A higher value gives greater distortion; a setting of 0 gives no distortion. The Fade slider sets the gradient for the Glass Color. A setting of 1 gives the maximum tint of the glass; a setting of 0 means the glass is completely untinted. The Shadow slider sets the gradient for the Glass Color. A setting of 1 gives the maximum tint of the glass; a setting of 0 means the glass is completely untinted. The GColor picker sets the Glass Color for the Magnify Glass. The setting of the Fade slider above determines how much of the glass color is seen. The Frame slider sets the Opacity of the frame that surrounds the Magnify Glass. A setting of 1 sets the frame to completely solid; a setting of 0 means the frame will be completely transparent (so invisible). The FColor picker sets the Frame Color for the Magnify Glass. The Magnify Curve controls the magnification distortion across the glass. The Opacity Curve controls the glass color gradient across the glass.